Writer’s block? Bruised ego? Try these essential oils for arists when resurfacing from a creative rut. Learn more about essential oils at a Wanderlust 108, or at our inaugural wellness conference, Wellspring in Palm Springs October 26–28. Yoga and art: both are powerful forms of expression with the ability to shift us into the ever-elusive “flow state.” It’s no surprise that so many yogis are artists (and vice-versa). While we may relish most moments of our yoga and our art practices, there almost always comes a time when we feel stuck or unmotivated. Whether it’s the all-too-familiar “writer’s block” or you’ve found yourself in a rut of comparison, frustration and procrastination are par for the course when you make art a priority. Herein, a hack: Aroma. Smell is the only one of the five senses that work directly on our middle brain, where the seat of emotion and memory reside. Smell is the ribbon that ties up our memories with emotion. What does this mean for your artistic, aspirational habits? If you use scent as part of your ritual to prepare for the action in question, your brain accepts that scent as a harbinger of what is to come and prepares for the forthcoming actions you associate with that smell. Applying a grounding blend before meditation, for example, alerts the brain that you’re about to sit on your cushion to tune in to tune out. By utilizing essential oils as part of your routine, you’re creating a neural shortcut of sorts that helps to reinforce the positive behavior you hope to make more regular. In other words, the negative feelings you have toward your art and practice become easier to manage. Here are three essential oil combos that you can use in this manner to evoke feelings specifically beneficial for artists. The oils that follow have been chosen as being the strongest candidates to evoke a particular frame of mind based on both their chemical composition and their long-standing reputations in terms of emotional support. Note: Oils marked with an * should be avoided during pregnancy. Wild Orange: “The Oil of Abundance,” wild orange is thought to inspire abundance, foster creativity, support a positive mood, and restore physical energy. Douglas Fir: rich in beta-pinene, a constituent long revered in folk medicine for combating feelings of depression and promoting focus. *Vetiver: promotes cognitive flexibility and emotional security, stabilizes the mind and promotes realism. Citrus has the power to lift moods and dispel the commonplace. What other than wild orange, then, could be the chief oil to turn to inspire creativity? Famous for its “feel good” effect, wild orange rounds out well with the soft but grounding scent of douglas fir. With just one drop of vetiver, which helps to balance the emotions, this blend is all about restoring energy and promoting cognitive flexibility. Suggested Use: This is a wonderful blend to use aromatically (as opposed to topically) so that the scent will continue to stimulate your olfactory circuitry and thus, your imagination. Putting three drops of wild orange in the diffuser with two douglas fir will get the senses awakened. Vetiver takes forever to come out of the bottle, but the payoff of that drop is a long-lasting base note that will beautifully underscore the other two oils. 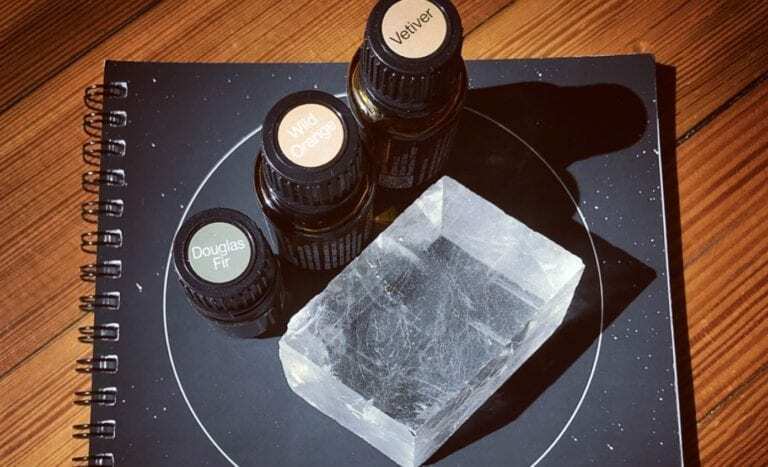 Use this trio in the diffuser each time you set up to work on an art project, when you sit down to write, or when you’re having a creative blockage and need something to lift you beyond the wall. Continued use of these oils for creative inspiration will render them more efficacious when your mind learns to recognize their scent as the time to take flight. Ginger: promotes motivation, courage, and self-confidence. Siberian Fir: promotes willpower, courage, and endurance, and (like ginger), also promotes motivation and self-confidence. Clove: “The Oil of Boundaries,” clove supports individuals letting go of victim mentality. Clove helps people stand up for themselves, be proactive, and feel capable of making their own decisions. Reconnects an individual to their personal integrity and builds up appropriate boundaries and defenses. This blend doesn’t mess—one whiff, and you realize it just smells serious. Ginger and clove have long been combined to add zing to recipes, but the list of their therapeutic benefits is long (highly antioxidant, support cardiovascular health, etc). They pair beautifully with Siberian fir, a personal fave, which contains the grounding comfort that you would come to associate with tree oils while also assisting in achieving mental clarity and emotional balance. Suggested Use: The harmony of these three make the task of breathing deeply an easy one. Never forget that the physical act of inhalation and release is of huge benefit to your body, so any blend that makes you breathe more deeply will create conditions that ease tension. Two drops each ginger and clove, with three Siberian fir can equally win the day in your diffuser or in a roller bottle blend kept by your desk. Note: Fill rest of roller bottle with carrier oil. *Black Spruce: promotes motivation and self-confidence. *Juniper Berry: promotes willpower, courage, and endurance. Cardamom: known as “The Oil of Objectivity,” cardamom helps with self-control as it redirects energy to the solar plexus, the center of responsibility. It also assists you in taking personal ownership and responsibility for your feelings. Suggested use: There are a few aromatic options for this blend, depending on where you need to call upon your secret rigor superpower. Two drops of each in a diffuser will help turn any room into a fortress of integrity, but sometimes you want this forcefield around you all day, in which case, you can put one drop of each on a large scarf to wear around your neck and shoulders and enjoy continuous aromatherapy as you navigate your day. If you would like to procure the oils mentioned above, click over here to Chop Wood Carry Baby, where we have curated a special package of these Essential Oils for Artists. These statements have not been evaluated by the Food and Drug Administration. These products are not intended to diagnose, treat, cure, or prevent disease. Karina Mackenzie has pursued many passions at Wanderlust HQ, including producing the Speakeasy Lecture Series and running all-things-digital back in the day. Currently, she is proud to be launching Chop Wood Carry Baby, a website offering some honest and raw reflections on the balance of parenthood and the “path,” as well as sharing some nature-based, essential oil-focused tools for mindful mamas as they chop and carry their way through the day. Follow Chop Wood Carry Baby on Facebook and Instagram.